Apparently heroin addicts can become so drug dependent their bodies cannot withstand the shock of withdrawal, and failure to continue taking the drug triggers multiple organ failures. I just wonder how apt that analogy is to our governments' debt dependency today. As long as governments think that taking these difficult decisions to end the addiction will be easier in the future than it is today, they will never take the decision today. At the very least, there will have to be a sufficiently large bond market event to force the issue. The quote is from a fascinating paper - Popular Delusions: Government Hedonism and the Next Policy Mistake - which spells out just how severe the sovereign debt problem has become for different countries. 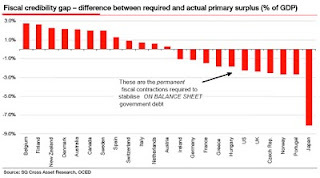 The chart shows the fiscal credibility gap for different countries, and it compares the primary balances governments should be running with those which they're actually running, to get a better feel for the challenges governments face in order merely to stabilise their on-balance sheet debt ratios. Reassuringly, Ireland is not in as a bad a position as most other countries to the right of us in the chart (especially the UK). That's partly due to the decisions that have been taken in recent budgets, and to our more benign demographic outlook versus, say, Japan. Interesting proposal by Phillip Lane that can probably be summed up in one word: Accountability. The lack of accountability is the glaring deficiency in Irish public life, and most of our current problems can be traced to that source. Ignoring George Lee's and Dierdre de Burca's fits of pique, the last political resignation on a genuine point of principle was Frank Clusky's back in the 80s over the long-forgotten issue of Dublin Gas! Considering the manifold disgraces in the political system since then, that speaks volumes about the amoral world inhabited by our public figures. Lane's proposals are sensible, but will they have any chance of being implemented in an unreformed system? In the UK the Governor of the Bank of England is obliged to write a letter to the Chancellor when there are untoward movements in the inflation rate. Something similar should be required of our Minister for Finance when the deficit breaches guidelines or borrowing looks to be getting out of hand. This could be a matter of the Minister being required to appear before a strengthened Public Accounts Committee to explain himself in such an event, with the option available to the committee of censuring him or making him rescind foolish or damaging decisions. 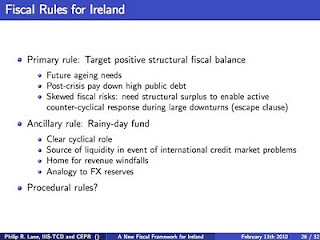 One wonders how Brian Cowen would have fared in such an appearance during his disastrous tenure as Finance Minister?